Mr. Greg Stager currently works as an instructional designer in northwest Wisconsin and has been involved professionally in education and technology since 2004. 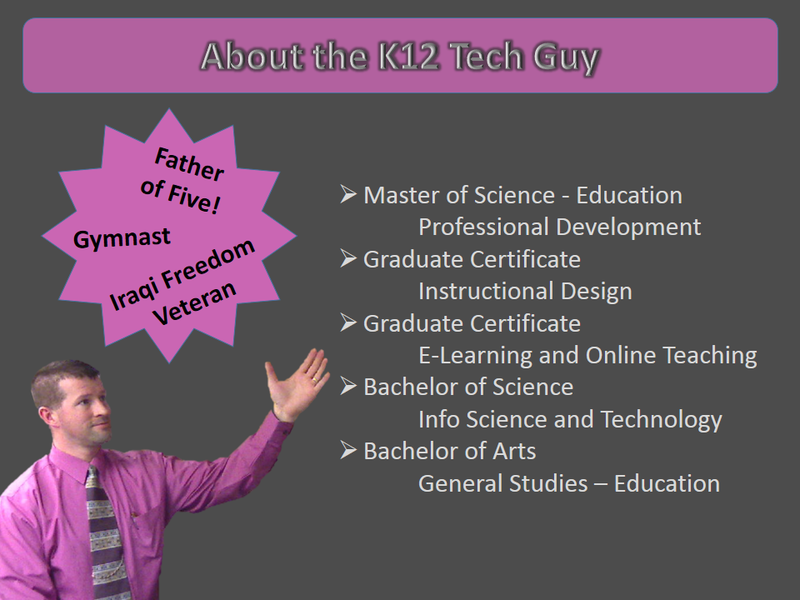 He has delivered several professional development workshops for teachers and administrators on topics such as Google Apps, iPads, Moodle, and online learning. Mr. Stager was also a keynote speaker for the Wisconsin Early Childhood Collaborating Partners Training and Technical Assistance Networking Event in September of 2010 and served as a guest panelist for the International Online Conference in March of 2009. Mr. Stager is a veteran of OIF I and spent 14 months on active duty as an Army Staff Sergeant and squad leader. He has also been coaching gymnastics for 20+ years with various age groups and levels. In his spare time, he enjoys learning, playing games, solving puzzles, geocaching, and creating multimedia projects. He lives in Wisconsin with his wife and five children.